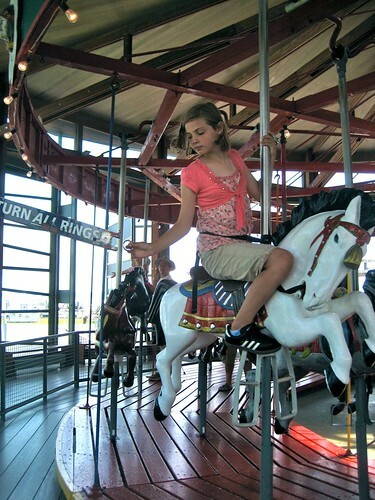 We took the car over on the ferry and the first sign of a cool place in my book was our visit to the vintage carousel right on the waterfront. 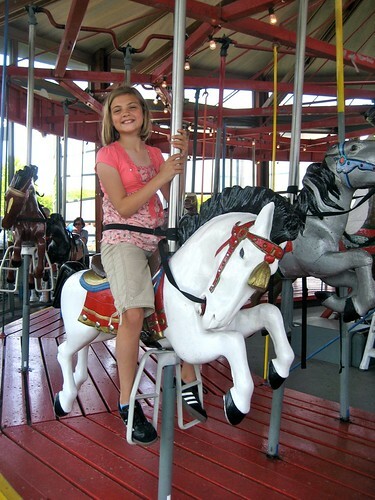 I wasn’t the only one who was happy to see these 1920’s era wooden steeds (0rginally built for a traveling carnival) whirling around, and one of the Retro Roadgirls was more than happy to try and grab the brass ring. Walking along quaint Front Street I was directed to go check out the interior of the Arcade department store, as my hostess knew I’d love the wide wood plank flooring and incredible variety of useful items. I spoke with a lovely little lady at the far register who said that the store had been there for at least 70 years, but also noted that there are for sale signs in the windows. With a little bit of something for everyone – shoes, work gear, back to school items, notions, stationery, home goods, hardware, it would be hard to imaging what could fill the void if this place were to close. 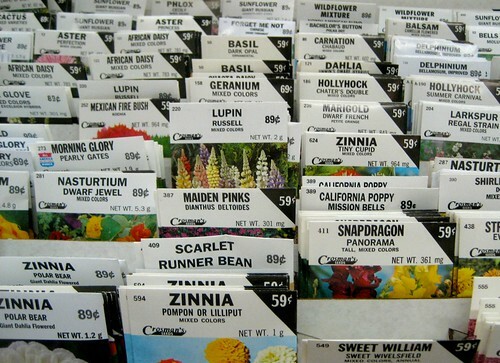 I bought some flower seeds and hope to plant them at the Hacienda! I was SO wishing we hadn’t had such a tasty diner breakfast when I spied the vintage restaurant sign and charming interior of the Coronet. 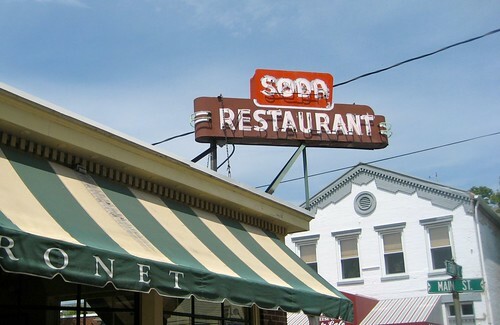 One thing I love about Long Island are the luncheonettes, and will make a plan to come back with an empty belly and do a proper review of the Coronet, but for now I’m simply smitten with the vintage decor and positive online reviews. 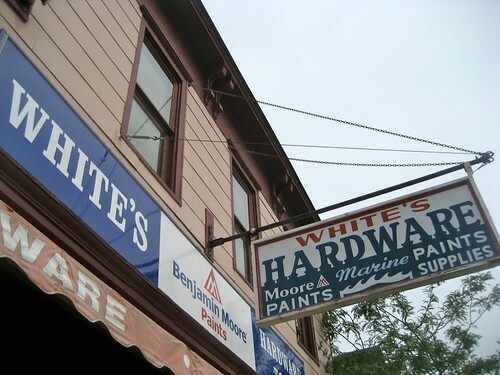 White’s Hardware is where I picked up a drain stopper for the old porcelain kitchen sink back home- do I know how to pick our souvenirs or what? 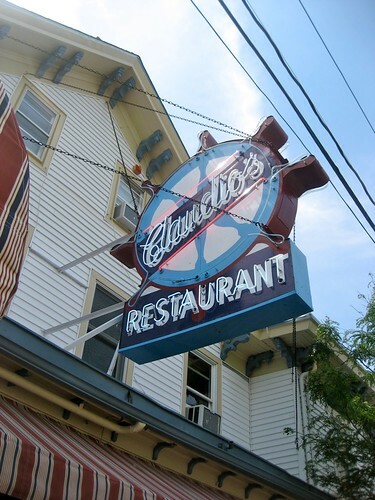 Little did I know that we were just across the street from the Oldest Same Family Owned Restaurant in the United States, Since 1870 – Claudio’s. We were in luck that the Retro Roadgirls wanted to watch the World Cup and I wanted to do some investigation into this historic establishment, so we stopped here for a spell. 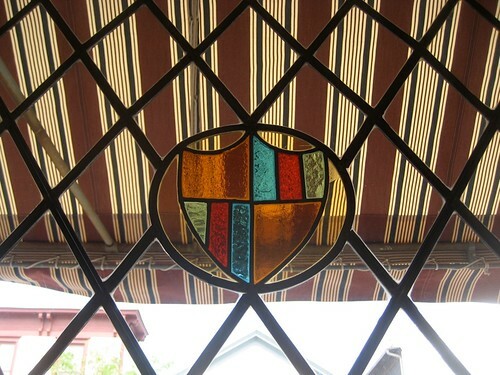 I loved the old stained glass windows and friendly service. And I’m told the bar was installed in 1886 when it was salvaged it from an old hotel being torn down in New York’s Bowery. 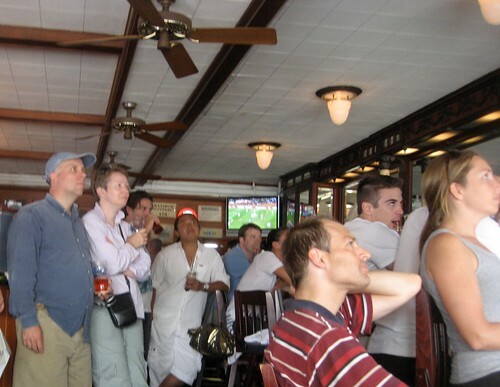 The day we visited it was swarming with soccer fans both local and international, and it was a heartwarming sight to see everyone getting together to cheer on the US Team. 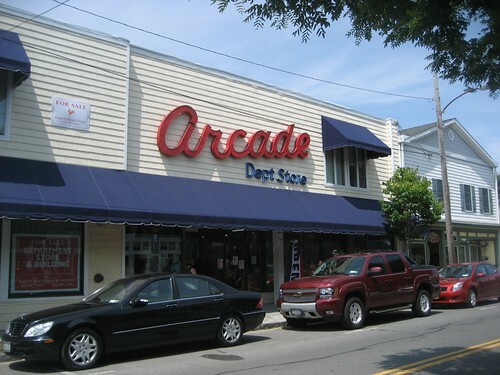 You know, there are still a lot of neat lil places in Greenport I have to tell you about, so I’m going to break this post in two! Stay tuned, and in the meantime, here’s the map, so you can start to plan your very own visit to Greenport! 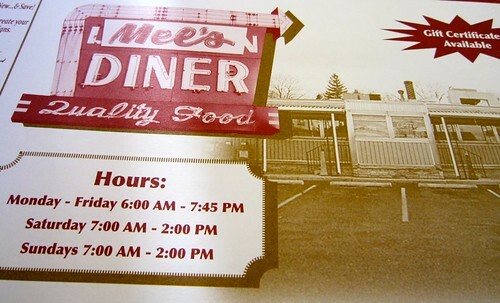 Mel’s Diner Lebanon PA – Cool Vintage Sign and Diner, Best BLT Ever! On a sunny summer Friday without a husband or dog to head home to, the road was a’calling, so I headed out west on 422 towards Mel’s Diner in Lebanon PA. 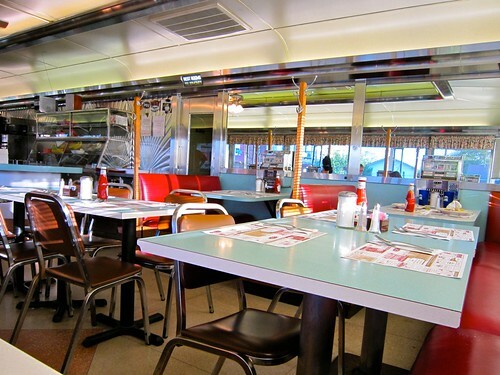 I remembered the great vintage sign and wanted to see what the interior was like on this vintage stainless diner, and I was not disappointed by either. Swoonworthy, no? Especially in our neck of the woods where we don’t get many fancy signs like this. Mel’s Diner, a 1955 vintage O’Mahony used to be called the Lincoln Diner and if you look closely at the sign you can see where the painted “Mel’s” sign is used to cover up where it used to be the Lincoln Diner (or you can look here at Spencer Stewart’s Diner Hunter entry on Mel’s Diner with his photos from a few years back, and you can definitely see where it used to be the Lincoln). 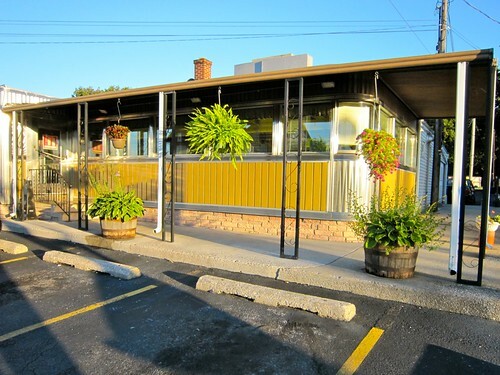 Covered up by a metal awning along the front and some mustard colored panels, the diner is still in good shape and open 7 days a week. Happy to have made it to the diner while they were still open, I was greeted by the friendly waitstaff and told I could sit wherever I’d like. And where does Mod Betty sit, when she has the chance? In the corner booth! I loved the way the sunlight was streaming in and highlighting this clean and cheery diner interior, done up in shades of blue and burgundy. 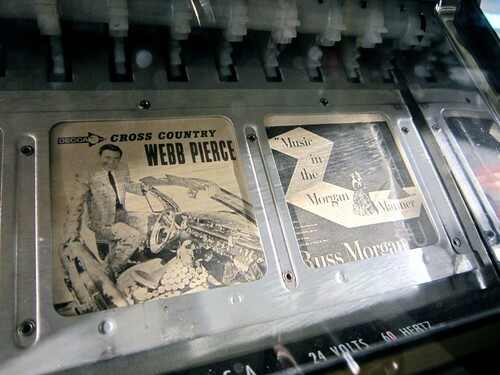 And as I turned to my table, I saw a familiar sight, a Seeburg Consolette vintage juke box, just like the one in my Hacienda kitchen (a gift from a dear pal) and I was pleased to see that it was in even better condition than my version! 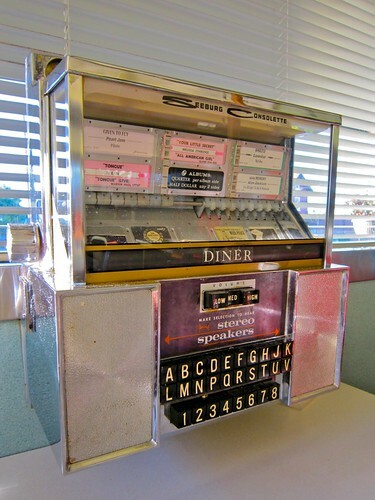 They even had the consolettes still at the counter, a very cool touch. While perusing the menu I was a tad bummed to not see chicken croquettes on the menu, as that is a go-to for me to try at a diner. I actually wasn’t that starving to be honest, so I went with my #1 sandwich on the planet, a BLT with mayo on white toast. And WOW, was I right to order this! 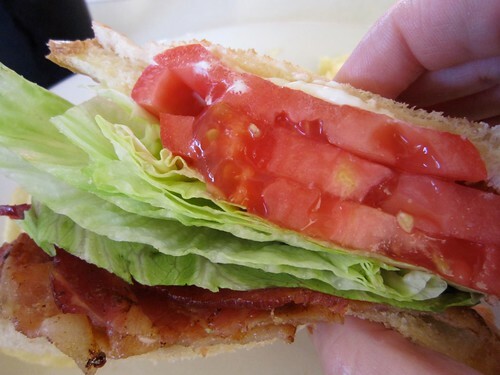 I was so enamored with this flavorful sandwich that I didn’t even think to snap a photo until one half was already consumed, but just take a look at that great tomato! As red as the sign outside and bursting with seasonal flavor, it took what is already a wonderful mixture of flavors and elevated this sandwich to a delightful experience. When I told the waitress how much I enjoyed the tomato she said that they do get a lot of their produce from a local farmer, which got a thumbs up in my book. Once you get a juicy tomato like this the hard styrofoam ones from the store just don’t cut it. While devouring my sandwich I loved overhearing the banter between the folks working and the folks dining. The lament about the lack of rice pudding or tapioca brought stories of an ill-fated experiment into cracker pudding, (a Pennsylvania Dutch treat that sounds pretty good to me) and the sharing that a family recipe for shoo-fly pie had been handed down and was ready to try. 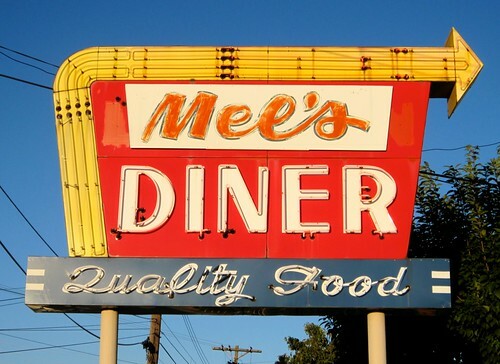 The waitresses seemed well acquainted with the folks dining here, and with a friendly smile, I felt like I was welcomed into the fold, even in those short minutes I wolfed down that delectable sandwich and was on my way. If all goes well I should be getting this boot off of my broken foot tomorrow, so a visit to the Shoe House in Hellam, PA seemed like a good way to commemorate my last limping weekend! 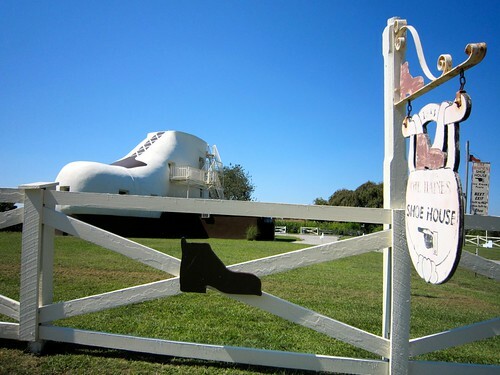 This “really big shoe” is visible from Route 30 and if you miss the sign for Shoe House Road this great vintage sign will beckon you to get off the highway. 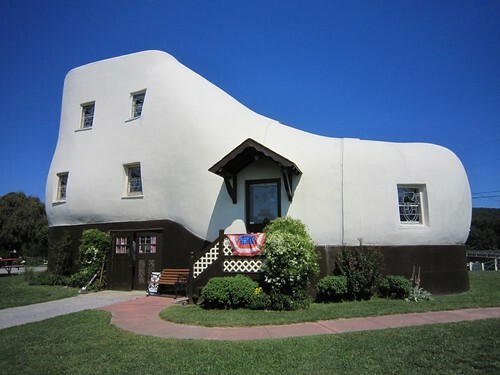 Built in 1948 for Mahlon Haines who had amassed a fortune selling shoes, the shoe house is quite a sight. 48 feet long and 25 feet high at the top, the interior includes 5 different levels, 3 bedrooms 2 bathrooms a kitchen and a living room. 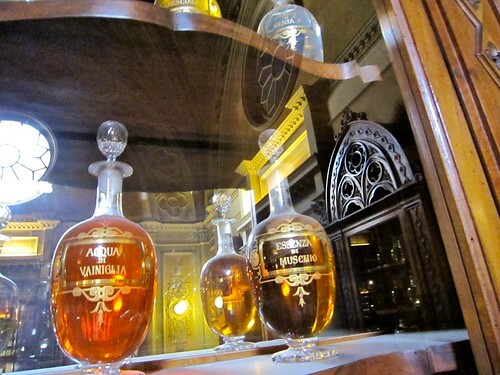 I won’t show you photos of the insides (then why would you take the tour?) but will tell you that I remember being impressed that The Shoe House had so many rooms in it. I also love the intricate stained glass windows, especially the entrance door window with the almost 3D likeness of Maholon Haines the self appointed “Shoe Wizard”. 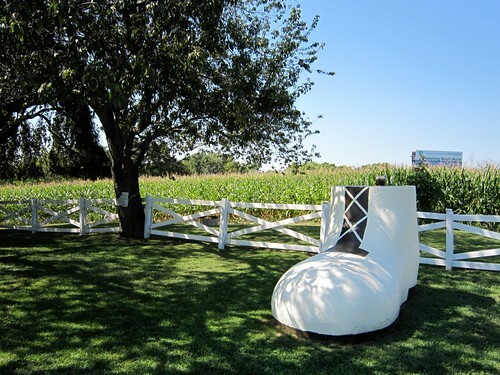 While Mahlon used this shoe as a sales gimmick and guest house, Carleen and Ron also spend weekends during the season staying inside the shoe itself, which sounds like a lot of fun to me. Ron also keeps busy making Shoe House bird houses which are for sale at the gift shop. Carleen notes that the Shoe House is a great destination for tour groups and often has age ranges from pre-schoolers (asking “where’s the old lady and all her children) to senior citizens. So if you have a group who is interested in a tour, this is a great lil destination. 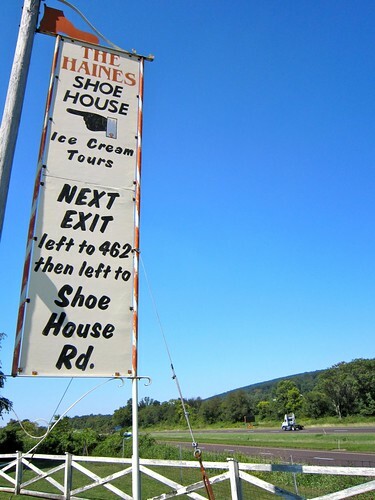 Folks of all ages enjoy the scenic surroundings and are encouraged to bring a picnic lunch or buy some hand dipped Hershey’s ice cream to enjoy under the trees – and near the Shoe House dog house! The Shoe House is open Wednesday – Sunday from 11:00-4:00 in June, July, August. September hours are Sat and Sun from 11-4 and October hours are Sat 11-4. The Shoe is closed November ’til April and they re-open in May, open on Saturdays and Sundays just in time for springtime retro roadtrips! If you want to make sure the Shoe is open for your visit, your best bet is to do like I did, and email Carleen at The Shoe House to let her know when you’d like to visit, and she can often arrange to be there. 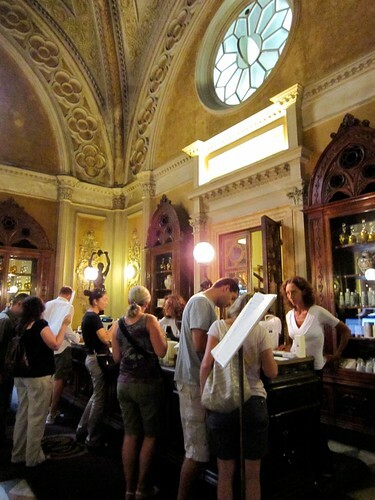 You can also arrange your group tours this way. This is great if you’re coming to the area from a distance, as it is one of my favorite destinations in the area, and well worth a tour. Good things to know – there are no public bathrooms (use the McD’s or Sheetz just down the street) they take cash only, and there’s a BBQ place on 462 at the bottom of Shoe House Road that looks like a great place to pick up a picnic! 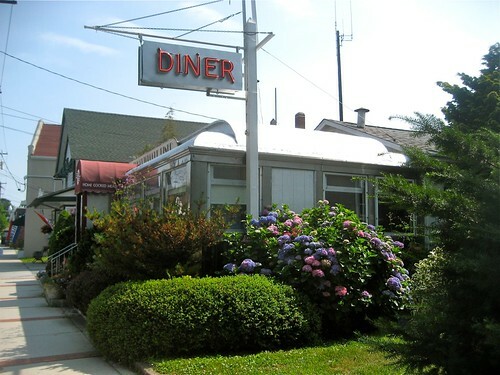 The Duck of Flanders – Say Hi-dilly-ho to this Long Island Landmark! What’s a roadtrip if you can’t pose in front of an oversized something? A trip to the outer reaches of Long Island would not be complete for a roadside giant loving fan without a visit to the famous Big Duck in Flanders NY. Why it’s practically historical in its architectural significance. And kinda cute too! Built in 1931 in Riverhead NY by a duck farmer in to sell ducks and duck eggs, it was added to the National Register of Historic Places in 1997. This cement quacker which originally had model T headlights for eyes has been historically renovated and was moved around a couple of times since settling in its current location since 2007. 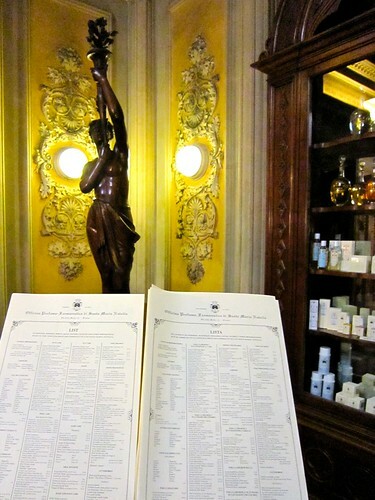 But all that is only a small bit about the important history of this place. 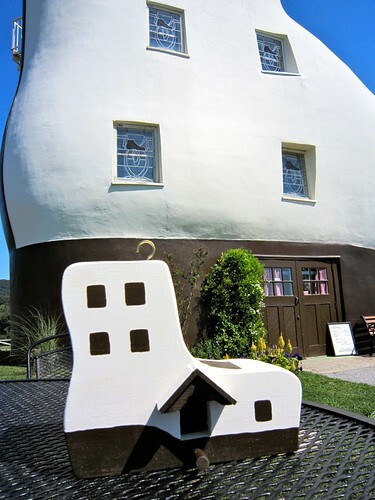 Buildings that are shaped to look like something else can be called follies, mimetic, novelty or programmatic architecture. 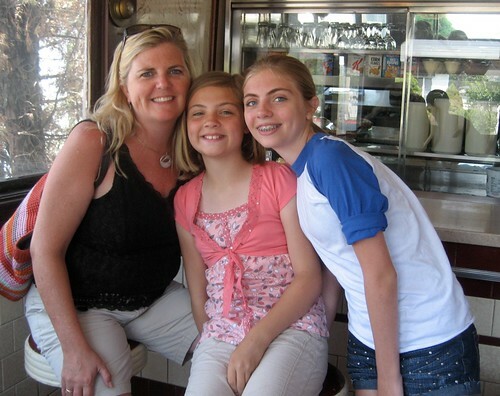 You know, giant teapots, tee-pees and the like. But an architectural term for these buildings is also a “duck” or “duck architecture”. This term was coined by famous architect Robert Venturi, and this big duck in Long Island is the reason he uses that term! I wasn’t sure that the duck was open when we pulled up, as it was a bit dark inside, but we entered to find a friendly volunteer behind the counter selling “duckamabilia” and other souvenirs. I could not help but pick up a book on roadside delights, and posed for a rare photo in front of the duck myself! So if you’re on Long Island, don’t be a goose, stop by and say hello to this cheery roadside bird, who has made architectural history! 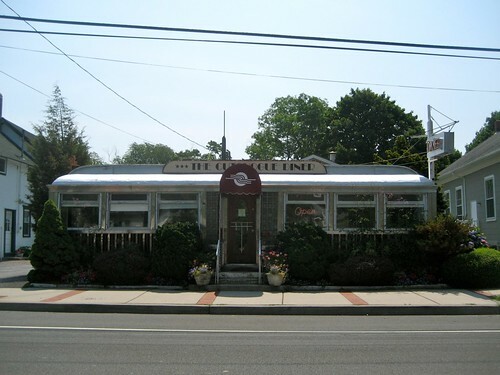 A well preserved 1941 Kullman, the Cutchogue Diner on Route 25 on the North Fork of Long Island was a great place to begin a day of fun with RetroRoadSuzanne and her RetroRoadfam. A small diner with a handful of tables and counter service of course, our gaggle of gals fit nicely at a corner table – always a fave for me. 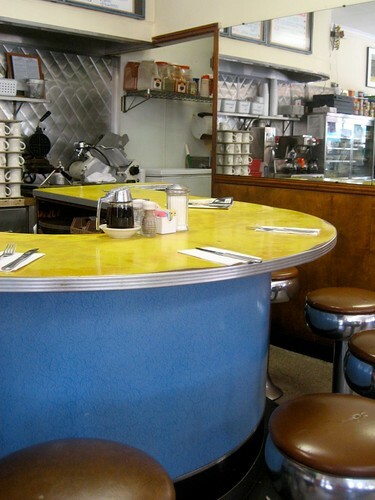 From this vantage point I was able to sit back and admire the vintage 1940’s feel of this diner, replete with tilework, vintage lighting fixtures and marble counter top. As we waiting for our pancakes and eggs “over medium” (a new one for me) I was able to admire up close the great diner china teacup with the name emblazoned upon. Kudos to Kim at Perry Designs for adding the spoon to this shot, love that diagonal line! I have to say, nothing makes me happier than to introduce folks to the fun of Retro Roadmapping and the importance of supporting the vintage and cool old places that are still around. Here’s most of our happy bunch and the Long Island branch of the Retro Roadgirls! With a day of driving and adventure ahead of us we ate our fill and left this great gem of a place happy, knowing that it was appreciated by both locals and vacationing folks alike. 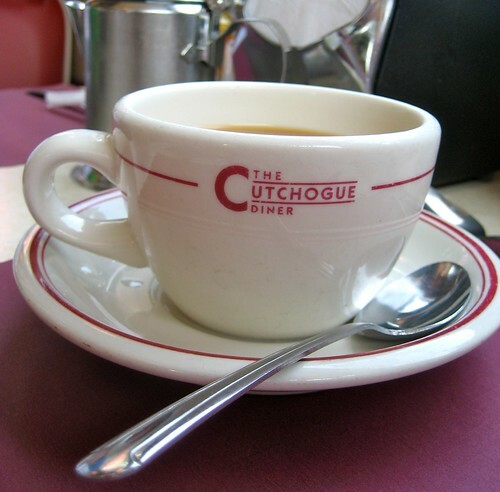 If you’re ever on the North Fork, put a fork in it at the Cutchogue Diner! 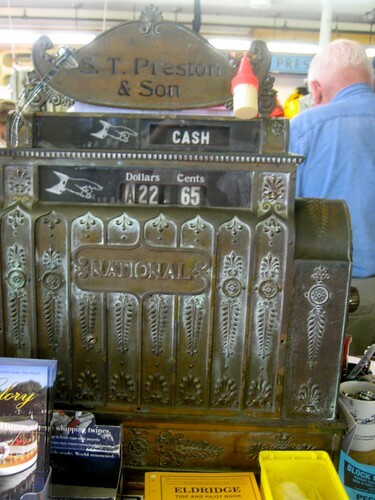 If we hadn’t just spent all sorts of RetroRoadmoney on our trip overseas, I’d be tempted myself to bid on this cool old vintage travel sticker display! Click here to see the details on this Lindgren Turner Revolving Vintage Travel Decal Rack eBay Listing and happy hunting! I didn’t expect to find a lot of “Retro Roadmap worthy” places during our vacation last week but I had to share one “wicked old place” with you all. 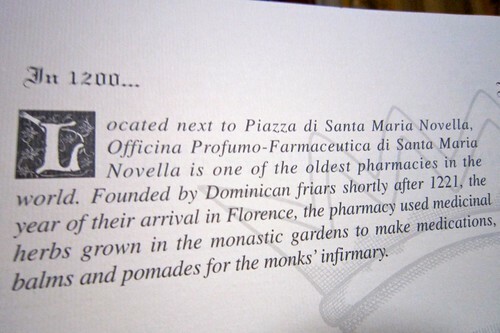 Reminding me of just how young the USA is, I present to you the Santa Maria Novella Pharmacy in Florence, Italy – opened in 1221 and still in business!